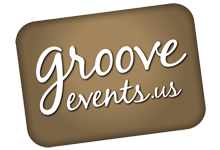 GrooveEvents.us presents custom lighting, entertainment and photo station at State Room Boston, a Longwood property! Amazing views, modern design and 500 corporate guests! DSE made the room look spectacular with their cabin, rustic design, earth tones and burlap and barrels attitude.